Mt. 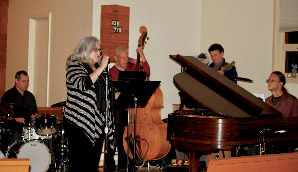 Carmel gathers for Jazz services on the second Sunday of every month at 6:00 pm. Building community through music, the Jazz service offers an experience that prioritizes the spiritual over the religious. A theme for the evening sets the tone for our time together as our talented Jazz musicioans, readers, poets, and writers share what is on their hearts.